Denise Treizman creates interdisciplinary work by repurposing found and ready-made objects spontaneously encountered during her daily routine. She interacts with some of these objects on-site transforming them into ephemeral sculptures or “street interventions” that disrupt their surroundings. Some of these materials are brought into her studio where they are incorporated into installations that are endlessly in-flux. 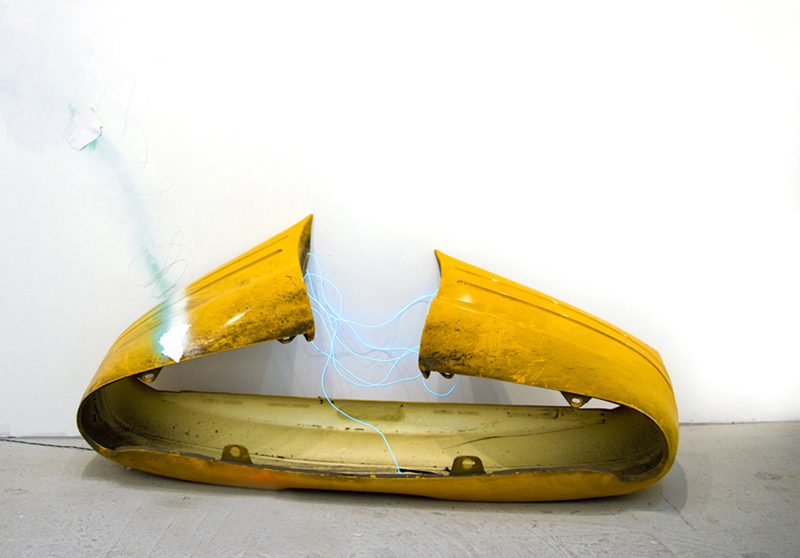 Treizman playfully transforms and combines objects through mark-making and sculptural gestures. By blurring the boundaries between mediums, this act investigates informality, improvisation and new forms of abstract assemblage. Treizman's work utilizes the excess from society, emphasizing an overly consumerist culture where materials are easily disposed of. Working both on the street and the studio, she asks the viewer to examine how worthless materials can present themselves as unexpected art experiences. Denise Treizman is an artist born in Chile, currently based in NYC. She has an MFA in Fine Arts from the The School of Visual Arts. She is a recipient of several awards including SVA’s Paula Rhodes award for excellence (2013), NYFA (New York Foundation for the Arts) Mentoring Program for Immigrant Artists (2014) and a partial Fellowship from the Robert Sterling Clark Foundation for a residency at Vermont Studio Center (2014). Treizman has participated in residencies at Pantocrator Gallery (Shanghai, 2012), the Brooklyn Art Space (NY, 2013), at Berlin Collective/APT Institute (NY, 2010) and at Ox-Bow (MI, 2014) In 2010, she conceived of and developed “FUTBOLisARTE”, a national initiative in which the shoes of the Chilean National Soccer Team were intervened by artists and auctioned to aid earthquake-affected Chileans. Her work has been shown individually and in group exhibitions in various cities of the world including: Santiago (Chile), Buenos Aires (Argentina), Shanghai (China), San Francisco, Chicago & New York (USA).